Welcome to the North Bristol Triathlon being held at Tockington Manor School, close to the A38 and M5 Junction 16. A location map can be found on the main website. The School postcode is: BS32 4NY. We anticipate registration opening at 6.45am with the first start at 8.00am, depending on final numbers. Car parking is provided in an adjacent field close by. This can be muddy if the weather conditions are unfavourable. Please follow the marshal’s directions and drive slowly for the safety of others. Registration is in the school pavilion on the lower field. At registration, competitors will be provided with their race number and security wrist strap. BTF rules apply. Any competitor who is not a BTF member and has not pre-purchased a Day Licence as part of their entry application will be required to purchase one at registration at a cost of £5. After registration, competitors will be able to access the transition area. Race briefings will be carried out approximately every 30 to 40 mins inside transition. It is each and every competitor’s responsibility to attend the race briefing. Competitors will be called to poolside in waves groups, of between 15 and 20 competitors at a time. Final start times will be posted on our website approximately one week before the race. As a rule the slowest swimmers will be set off in the first waves and the fastest swimmers in the last waves. The event is chip timed. Competitors will be fitted with timing chips on poolside. The route between the pool rear entrance and transition will be laid out with Astroturf and rubber mats. The swim crosses the road to the lower field. We have permission to stop cars and the route will be fully marshalled. But we ask friends and supporters to keep the route clear at all times. Friends and supporters can view the swim from the main pool entrance. We have additionally added a Relay category this year. Competitors are eligible for prizes in one category only. The open category prizes are awarded first, and then veteran’s categories according to the age. The swim marshal will direct you to your assigned lane. Lap counters will advise you of the direction of the lane you are swimming in. Swim caps will be provided on poolside. Lap counters will indicate when you have two lengths to go, but you are responsible for counting your own laps. Your bike must be road legal and you must wear a cycle helmet. The helmet must remain fastened at all times whilst your bike is off its rack. Handle bar ends must be plugged. After collecting your bike, you must only mount you bike after crossing the line in the road after transition and then dismount before this line on your return. Please follow the marshal’s instructions. 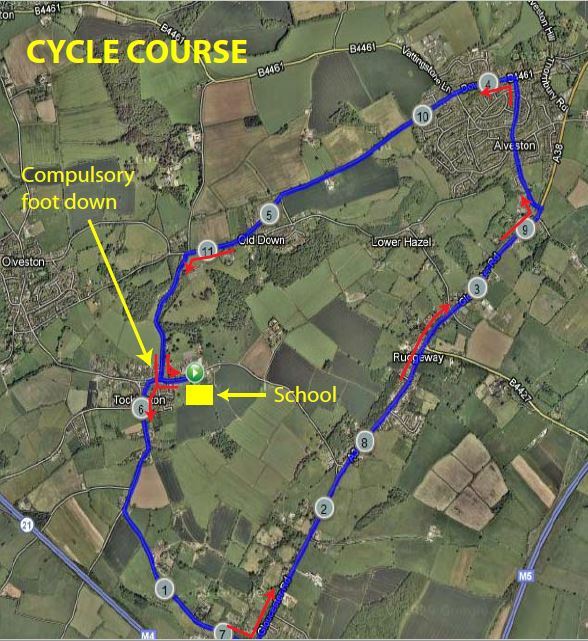 The bike course is two laps. 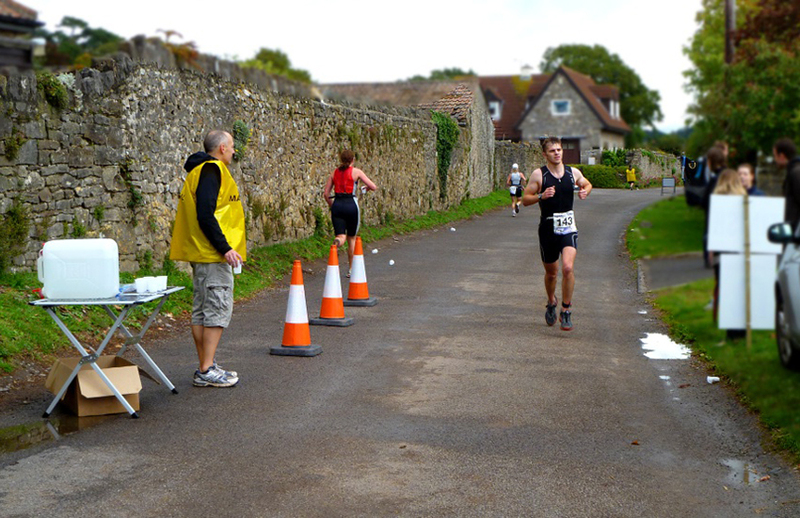 The laps starts and finishes at the bottom of Old Down Hill, turning right at the end of the first lap and left (returning to the school) at the end of the second lap. This junction is a compulsory stop for all competitors when turning right. You are not permitted to simply cycle through, even if clear, or drag one foot along the ground and claim you have place your foot down. Failure to do this will result in disqualification – no exceptions. To enforce this, the junction has timing points on it. The time between these points is deducted from your race time so there is no benefit in racing through the junction. If either timing point is not triggered because the corner is cut, or the time between the two points is adjudged to be too quick, you will be automatically disqualified. The approach to this junction is also a fast descent so please approach the junction with caution and plenty of time to stop. A similar timing system is in place for the traffic lights on the A38. Cycle in the cycle lane every time. The time between the two timing points on the lights is deducted from your race time. No drafting is permitted. You are responsible for counting your laps. Your race number must also be clearly visible. The run course is largely off road comprising a loop of the field at the start, an out and back section, and then another loop of the field before crossing the finish line. Whilst the course is firm under foot, it may be uneven in places. A water station will be set out at the start and finish of the run. Your race number must be clearly visible. Competitors are not allowed to visit the course in advance of the race as a large section of it runs over private land. Accordingly we will not be posting an advance layout of the route. Your timing chip will be removed directly after the finish line. Please remember this is private property and we would ask competitors, parents and spectators to respect this and take rubbish with them or deposit it in the bins provided.